The Columbia Series 5814 In‐Line Charge Converters are specifically designed to convert the charge signals from a high impedance piezoelectric sensor into a voltage signal output with low output impedance, thereby eliminating the need for costly charge amplifiers in many applications. This device can be used with all Columbia non‐integrated piezoelectric accelerometers and pressure sensors. The advantage of this device is that it contains an active signal channel powered from a common external standard DC power supply. This makes it the perfect signal‐conditioning match for any high impedance piezoelectric sensor. 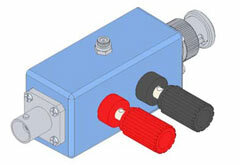 The converter is available in three factory setting of 0.1, 1.0 and 10.0 mV/pcmb. Sensor inputs utilize a #10‐32 coaxial connector with the signal output presented on both male and female BNC connectors. Power is applied via the two binding posts. Consult the factory for customizes versions of these sensors.